Fat bike from Luleå and discover northern Sweden’s Bothnian archipelago on this 4 night microadventure. Ride across the sea where each winter the waters freeze up to 1m deep. With your guide, Eric, you'll discover the archipelago by riding through nature reserves and on ice roads to Hinderson island before heading further in the archipelago to the edge of the sea ice! Just south of the Arctic circle, don't forget to look out for the elusive Northern Lights! You'll be met at Luleå airport for the short transfer to your hotel. After breakfast at the hotel you'll be equipped with your bike. We'll then do an easy ride on the ice track before enjoying an outdoor lunch. The afternoon is free for activities, choose between ice skating, dog sledding, snow shoe walking or just exploring Luleå, the Gammelstad Church Village is well worth a visit! Today we'll fat bike through Luleå to the Hertsöträsk nature reserve. From there we take another ice road and explore the archipelago on marked snowmachine trails or ice road. Lunch is taken on Hindersön island before riding further in the archipelago to the edge of the sea ice. We'll return to Hindersön where we will have dinner by an open fire and overnight in a cabin. Tonight you'll have an excellent opportunity to see the Northern Lights! Ride details: Approx. 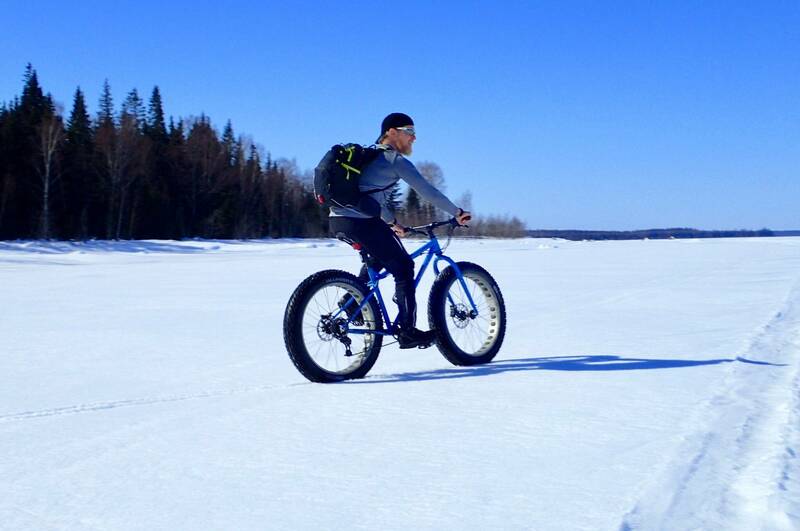 35km fatbiking on varied terrain including snowmachine trails, ice and island roads. After breakfast we'll return to Luleå from Hindersön Island. We'll lunch outside before continuing to town with the option to finish the tour at the end of the ice road (25 km) or we will continue back town. The day culminates with a complimentary spa package and reserved table with complimentary appetizer at a local hotel & spa. Breakfast at the hotel followed by transfer to the airport. Note: This itinerary and the duration of the activities are subject to change due to participants abilities and preferences, weather conditions and forecasts, trail conditions, etc. Our guides will do their utmost to ensure the best possible experience without compromising safety at any time. Although all care and preparation is taken to ensure a wonderful, unique and safe experience; weather and environmental conditions are outside our ability to predict. Our guides will monitor all activity factors closely and make the final decision for the event to proceed prior to the activity. We reserve the right to cancel, postpone or modify any activity based upon weather, prevailing environmental conditions or other factors that may impact safety or enjoyment of the activity. You'll ride on varied terrain on snowmachine trails, ice and island roads. Riding on snow is harder than on a hard surface, so participants need good basic fitness and previous experience of biking. You'll be accompanied by your guide, Eric, a retired US Army First Sergeant and Wilderness First Responder who has made Sweden his home. We recommend flying to Luleå airport where a transfer will meet you to take you to your hotel (15 mins). Important: Please book your flights only after this trip to Sweden has been confirmed by invoice or email. Flights are not included in the advertised holiday price. - Dog sledding: 1 hour dogsledding, snack, and transfer: £149 per person. - Dog sledding: 3 hour dogsledding, snack, and transfer: £189 per person. - Snow shoeing: Late afternoon including dinner. approx 3 hours. This tour starts a short drive, 15 min, from Luleå: £129 per person. - World Heritage Gammelstads church town 2 hour guided tour, including coffee and cake: £69 per person. Fatbikes are included and will be either Surly Ice cream truck or Cannondale fatcaad 3. The Fat Bike Microadventure in Sweden's Lapland tour stays in the Naran Hotel in Luleå on nights 1, 2 and 4 and at the Jopikgården on Hinderson Island on night 3. 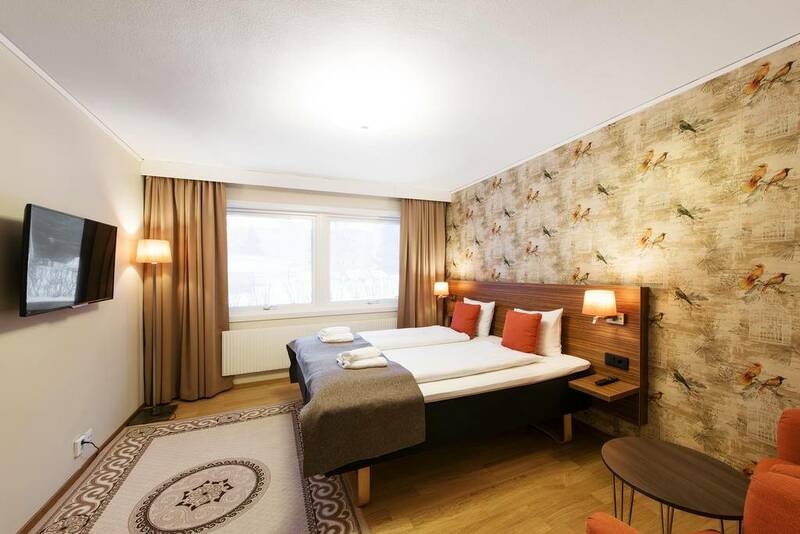 The 4* Naran Hotel is a centrally based, newly renovated, cozy and family owned hotel. On Hinderson island accommodation is in cabins, these are either 4 person or 6 person cabins, sharing one room. There are no shower facilities, but there is a wood fired sauna.